1.It is indeed my privilege to visit the Republic of Ghana on the first ever State Visit by a President of India. I am accompanied by a delegation of Parliamentarians that represent diverse regions of our country. 2.We bring the warm greetings of the people and Government of India. I would, at the very outset like to convey my sincere appreciation for the warm welcome extended to me and to my delegation and the excellent arrangements that have been made for us since our arrival. 3.Excellencies, the goodwill between the peoples of India and Ghana transcends the geographical distance between us. Our affinities - underlined by the trust that we share - defy the traditional logic of diplomacy and foreign relations. It is a bond forged in the hearts and minds of our two peoples. The India-Ghana brotherhood is anchored in our similar experiences, nurtured by the shared aspirations of our peoples and guided by the vision of our Founding Fathers. Blurred by the murk of contempt. more benighted than your own dark jungles. 5.Tagore had echoed the sentiments of solidarity of the people of India. The principles of Non-Violence and Satyagraha espoused by Mahatma Gandhi, Father of the Indian Nation, had also inspired the Indian people’s support for decolonization of Africa and the anti-apartheid movement. 6.The people of India fondly remember Dr. Kwame Nkrumah, a great son of Ghana and a visionary leader of Pan-Africanism. He embodied Africa's dignity, and inspired the peoples and the governments of African countries to claim their rightful place in global affairs. 7.I am heartened to note that Ghana is the first sub-Saharan African nation to have successfully halved poverty levels and that it has crossed the threshold to become a Low-Middle-Income country. I have no doubt that your dynamic government has already set itself new goals for achieving even greater heights of progress and prosperity for your people. I offer you my best wishes for the success of your endeavours. 8.Excellencies, Ladies and Gentlemen, as the Head of State of the world's largest democracy, I would like to congratulate Ghana for its giant strides in strengthening democracy. Not only in Western Africa, but in the entire African Continent, Ghana is regarded with respect - as a nation of robust democratic institutions. Our bilateral relations have expanded and deepened over the years. Both investments and trade have seen rapid growth. The Government of India and the Indian corporate world recognize the rich potential of the Ghanaian economy. Indian companies would be happy to invest in Ghana if the right opportunities are given to them. We look forward to working with you to realise the full potential of our synergies to our mutual benefit. 9.India will continue to extend the hand of co-operation to Ghana as it marches towards prosperity. Ghana can always count on India’s hand of friendship and co-operation. India will be happy to offer assistance and support in all areas where it is required by you. Our scholarship programmes under the Indian Technical Cooperation Programme and Indian Council for Cultural Relations are open to you and we welcome your citizens to avail our schemes for human resource development. 10. I take this opportunity to convey the appreciation of the people of India for your active participation and contribution in the 3rd India-Africa Forum Summit held in New Delhi in October last year. The Government of India seeks Ghana's continued support in fulfilling the vision of the Forum and achieving its common goals for realising the collective aspirations of our peoples. 11. I am aware of the significant advancement made by Ghana in achieving its Millennium Development Goals and Sustainable Development Goals. I take this opportunity to congratulate Your Excellency, President Mahama, on your appointment by the Secretary General of the United Nations as the Co-Chair of the Advocacy group on Sustainable Development Goals. 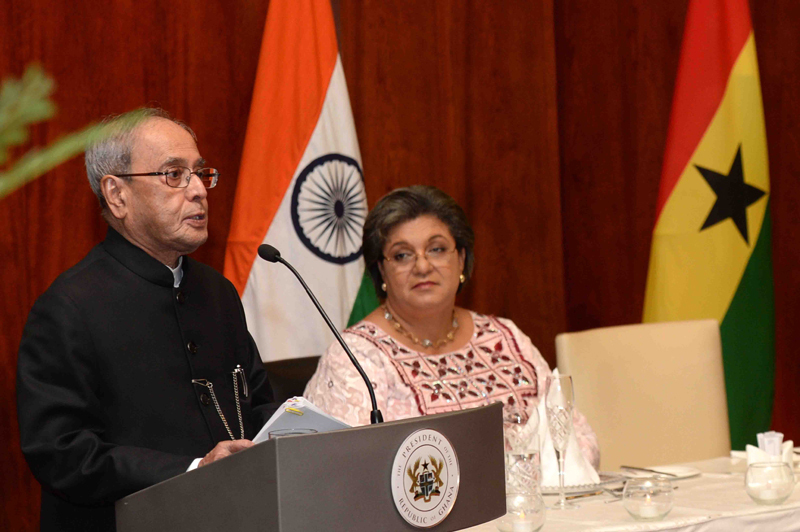 India recognised and appreciated Ghana's active role in the fight against Ebola. We also laud Ghana's dynamism in the Economic Community of West African States and welcome your efforts to promote greater integration within the region and across the African continent. 12. Since India and Ghana became independent States, the world has transformed itself. Today, the world order demands global governance structures that are consistent with the new challenges that confront the global community. It is a serious anomaly that India, home to every sixth citizen of the world and Africa, a vibrant hub of the global economy, still remains out of the UN Security Council. 13. Excellency, India, as a victim of terrorism for over three decades, shares your concern that this has become a global menace. It is a scourge that knows no borders; it has no ideology except the ideology of wanton destruction. It must be eradicated through the collective efforts of the civilised world. India stands in solidarity with you as you confront this challenge. 14. I take this opportunity to convey my deep gratitude to the Government and the people of Ghana for warmly embracing the Indian Diaspora. I am glad to note that they have become an important bridge linking our two countries. 15. With these words, I thank you once again for your gracious hospitality. -to the enduring friendship between the peoples of the Republic of India and the Republic of Ghana.